This is the story of how Limestone is processed to produce cement of the highest quality. Cement is the foundation on which we build our homes, roads and societies, so we take pride in ensuring that our product has consistent and reliable quality. At Wonder Cement, we deploy state-of-the-art German machinery and a variety of technological innovations like ROBOTIC LAB to create cement that you can trust. Scroll through the graphic below to see how our process works. First, we need limestone, which is extracted from mother earth by using NONEL (Shock Tube) eco-friendly blasting technology. Then, with the help of dumpers and shovels we put the limestone into the dump hopper where it is carried by apron feeder to the Wobbler for further processing by screening & sizing by crushing. Limestone deposits are mainly extracted by bench mining in which holes are charged with ammonium nitrate and fuel oil explosive and blasted. The rock is excavated with front end loaders (10 m3 capacity), loaded into 55 to 60 tons and then transported to the crusher. Clay and shale is normally extracted using front end loaders and loaded into haul trucks. When they occur as overburden, the unused clays and shales are stored and often reused for reclamation in the mined out areas of the quarry. 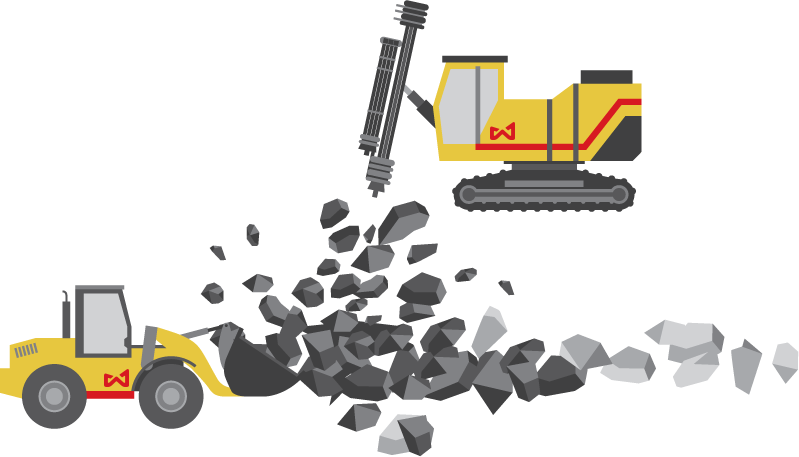 Our high-tech crusher breaks the limestone boulders to the required Raw Mill feed size. Chittorgarh Area in Rajasthan is known for its superior quality limestone deposits, possessing high lime content that gives high early strength and ultimate long-term strength. Another characteristic feature of this limestone is low alkali, low magnesia and low chloride content, which are highly desirable parameters for concrete durability. As limestone passes through the Wobbler, particles less than 50 mm are separated and passed to the secondary vibrating screening equipment, where particles smaller than 10mm are rejected and removed. 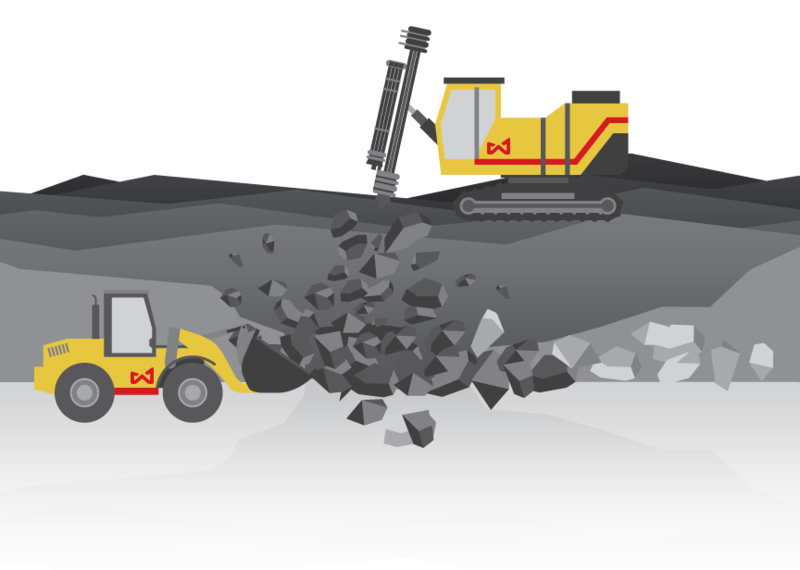 The limestone larger than 50 mm goes to the Rotary impact crusher where it is further reduced to less than 75 mm and sent to surge hopper by belt conveyor for pile preparation. The limestone of larger than 10 mm from secondary screen plant is then added to this mixture. The job of grinding is done by the Vertical Roller Mill, which works like a cyclone to create a fine dust of evenly sized particles. 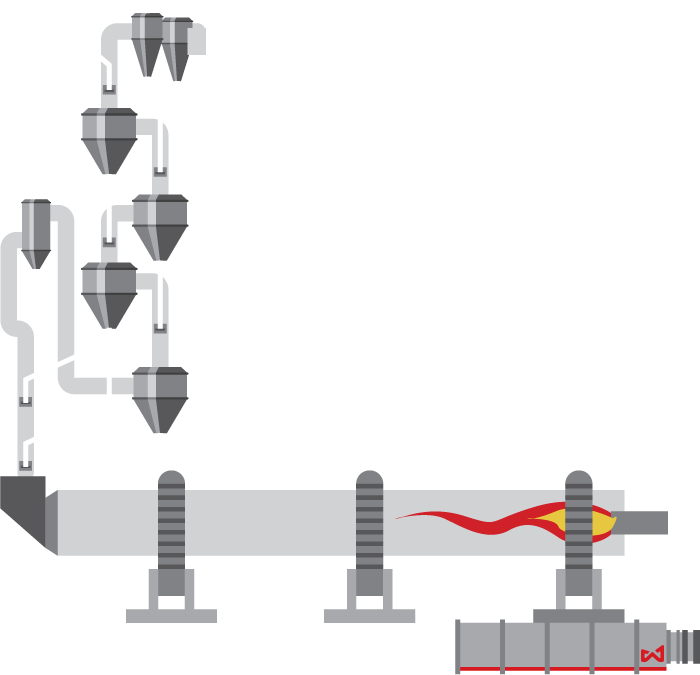 As the feed is ground on the horizontal grinding table, hot air is pushed upwards from underneath forcing the smallest particles to rise. 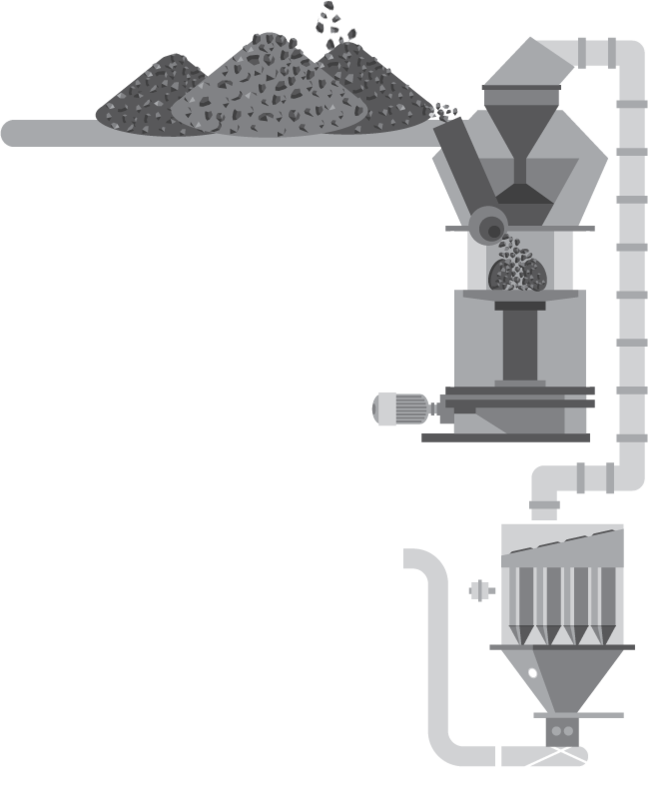 The finest particles pass through a separator into the mill compartment at the top, while the heavier particles descend again to the table for further grinding. The state-of-the-art technology adopted at the plant consists of a Vertical Roller Mill from Pfeiffer, Germany for Raw Material grinding to achieve the optimum fineness and controlled particle size distribution. In the mill, the feed consisting of Limestone and additives is ground between a horizontal grinding table and three rollers, which are pressed against the grinding table. Hot air pushes upward from underneath, creating a whirlwind of particles that rises along the periphery of the mill. 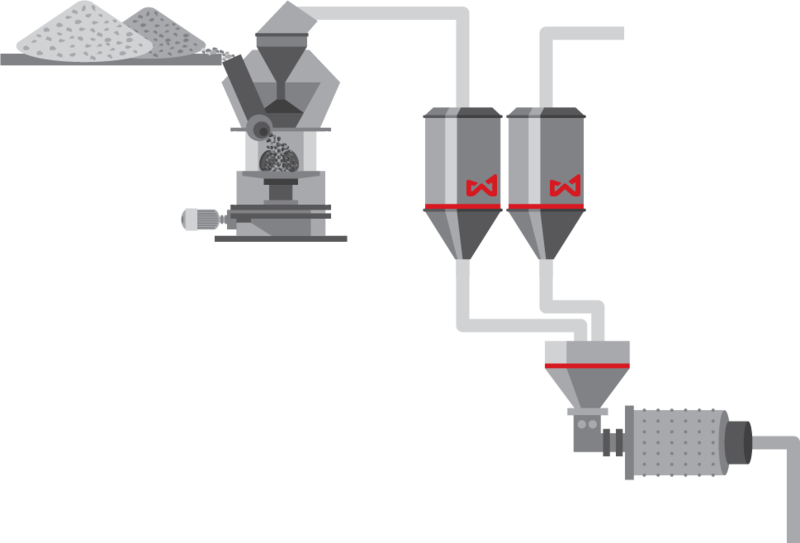 The finest particles pass through a separator into the mill compartment at the top, while the heavier particles descend again to the table for further grinding. In this stage, extreme heat is applied to the mixture, causing a series of chemical processes to form new compounds known as 'clinker minerals'. The raw material first passes through the 6-stage ILC preheater before entering the rotary kiln, where the mixture reaches its burning point and eventually undergoes a chemical transformation. Wonder Cement plant has a 75 meters long and 5.0 meters diameter rotary kiln supplied by M/s Polysius Thyssenkrupp, Germany for manufacturing clinker. The clinker is produced by burning the finely ground raw material in a rotary kiln. The temperature in the burning zone is usually 1400-1450 degrees Celsius and the residence time in the kiln is about 15 minutes. The process taking place in the kiln system consist of a temperature dependent decomposition of the raw material minerals, followed by a recombination of the liberated free reactive oxides forming clinker minerals, the most important being C3S (Alite), C2S (Belite), C3A and C4AF. Clinker formed in the rotary kiln is cooled inside the Polytrack cooler from 1450 degrees Celsius to around 110 degrees Celsius, and then it is stored in the clinker silo. In the final manufacturing stage, gypsum is measured and added to the clinker in order to yeild the final product. After first passing the mixture through a roller press, it is further reduced into a fine powder with the help of a single chamber ball mill. The final manufacturing stage occurs in our two combi-circuit grinding ball mills where the clinker is mixed into a fine powder with 4-6% gypsum. Gypsum is responsible for retarding the setting time and increasing the workability of cement. After first passing the mixture through a roller press it enters the single chamber ball mill, where 155 metric tons of tiny steel balls carry out the fine grinding. Finished product with separator air is passed through multiclones where finished product is separated and stored in cement silos with the help of mechanical conveyors.  Our cement is stored in four silos, then extracted and bagged by eight consistent high accuracy electronic roto packers. The packaged product in finally transported by trucks and railway wagon into the hands of satisfied customers. Our POLAB Advance Module Technology ensures the highest standard of production using a series of analyzer units such as pneumatic tube, fluorescence spectrometer, diffractometer, laser granulometer and color difference analyzer. Samples of all initial, intermediate and final products are taken automatically at short intervals from individual sections of the production process so that we can guarantee cement of the finest quality. Our Bhatkotari limestone mines have proved reserves of over 330 million tons! Our plant at Nimbahera requires 6.75 million tons of this raw material per year to fulfill its installed capacity. Our Cross-belt Analyzer has the world's best Combi CBA plus CNA technology to provide online quality control for limestone. 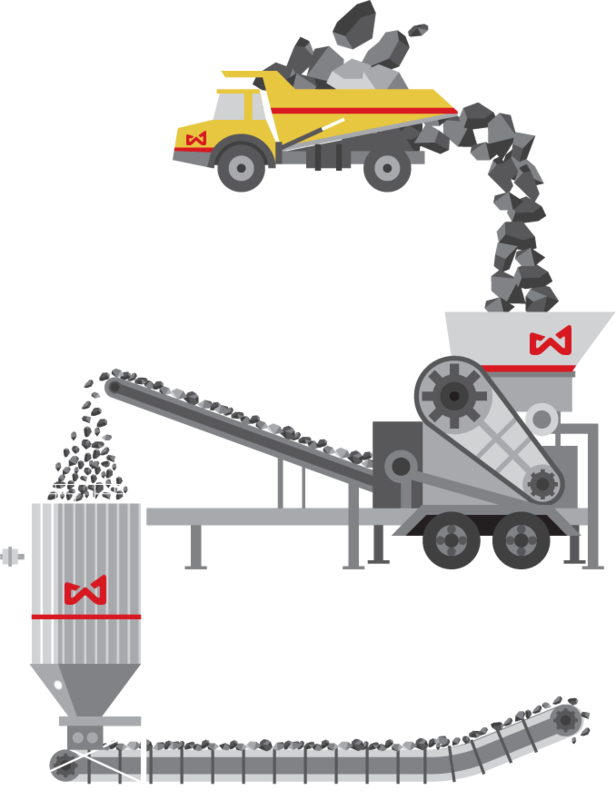 Wonder Cement is the first company to introduce this technology in India. Our Vertical Roller Mill is supplied by Pfeiffer, Germany - a global competitor in cement technology. The grinding table rotates at 21 rpm and the mill has a capacity of 550 tons per hour. Our rotary kiln induces a controlled and precise sequence of chemical reactions to create the clinker minerals. The most critical ones, Alite and Belite, are actually silicate crystals, which are responsible for providing 'strength' to the finished cement when mixed with water. We use a closed-circuit grinding process to obtain a very finely ground cement. A size particle range of 3 to 30 microns (one micron is a thousandth of a millimeter!) results in the most efficient hydration of cement and better strength properties, including more late strength. The Wonder Cement factory process is now complete. From blasting the limestone to packaging the product, every stage of production is carried out with the utmost attention to detail so that every sidewalk, every school, and every city built on Wonder Cement can enjoy 'Ek Perfect Shuruaat'.